We have all heard the numbers. Eighteen million Californians live in or near poverty. There is a lack of middle-skills workers and good middle-class jobs go unfilled. How can we fix that? Three days every week college students from the West Hills Community College campuses pile into vans and take the one-hour-plus journey into Fresno to learn workforce skills in a critical sector---technology. They spent eight hours a day, learning, working and dreaming at the Geekwise Academy, the technology training program at Bitwise Industries in Fresno. 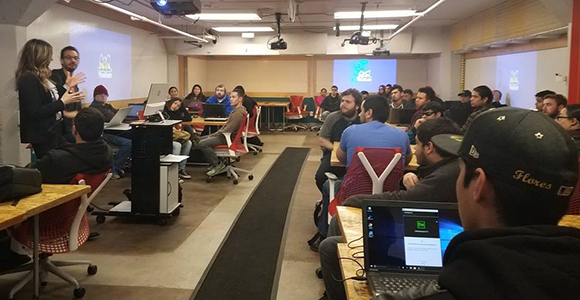 “The mission of Bitwise Industries is to connect people in the Fresno region to world-class education, environment, and innovation opportunities in the technology industry so that they can achieve personal success,” said Geekwise Academy Chief Executive Officer Beth Mily. And for the students that come to Fresno from West Hills, the opportunity is extraordinary. The program may literally be changing the lives of participants, many of who are children of migrant workers. For a 32-year-old single mom of three girls, Martha Hernandez is very cognizant that this is a real opportunity for her and her children. She started school last year and has been in the program for several months. “I’m learning lots and am about halfway done. I’m excited about what this can provide me,” Hernandez said. This from a woman who understands poverty and who worked in seasonal jobs for five years. Twenty-one-year old Carlos Flores was part of the first cohort through Bitwise and he already knows his life has changed for the better. “I had some experience in computers in high school, but this took me to another level,” said Flores. As an example, he had to learn a new coding language and more in order to work on a website project for the UCSF Medical School in Fresno. “We learned the language, how to deal with the customers, how to meet deadlines. It is a real-world experience,” Flores said. For Bitwise’s Mily, the program is helping meet another important objective. The program, which takes a year to complete has three phases: First students like Martha are learning the basics, then like Carlos did they start working on real projects and finally there’s a freelance phase where they learn how to market their skills and become either employees or a companies or independent contractors. For Flores, who has now finished the program, it has changed the arc of his life. “I expected to major in biology when I was in high school,” he said. “Now I plan to go Fresno State University and major in computer science. What will he be doing five years from now? Either way, his life and the lives of others he touches can be better and the local economy will benefit. "This program is a winner for the Valley. Not only does it help us address the workforce shortage in technology but it also helps lift people into the middle class by giving them important and marketable skills," said Dr. Stu Van Horn, Chancellor of the West Hills district. "We strongly believe these types of programs are necessary to continue to spur California's economy for years to come. The California Economic Summit, which has been working on workforce issues for all of its seven years of existence, is looking at ways that can develop policies and partnerships that will help improve rural California’s economy. "Rural California must be elevated to fully participate in the 21st-century economy in our state. More innovative programs like this at West Hills that improve work skills can help more rural Californians make a successful journey into the middle class,” said Jim Mayer, CEO of California Forward, the managing partner of the Summit.